This is an issue I struggled mightily with last summer before I met my BTB. You see, before my coach got her hands on me, I was a group training devotee. Thursday morning Forest Park runs with STL Tri Club. 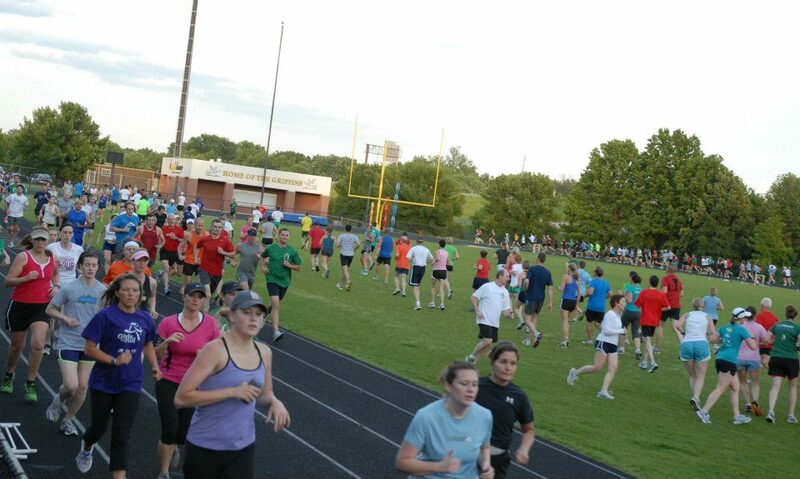 Tuesday night track workouts with Big River Running. Wednesday night rides at Lost Valley. Weekend group rides with TrailNet. I did it all. Then, when I started training per my coach's instructions, things got difficult. My prescribed heart rates yielded paces nowhere near (read: way slower than) my Thursday morning run group's average. Speedwork was out the window. Even group bike rides were too fast for my plan. Since most of my friends in St. Louis are athletes of some sort (tri or adventure), it made me really sad to miss out on the social aspect of training. 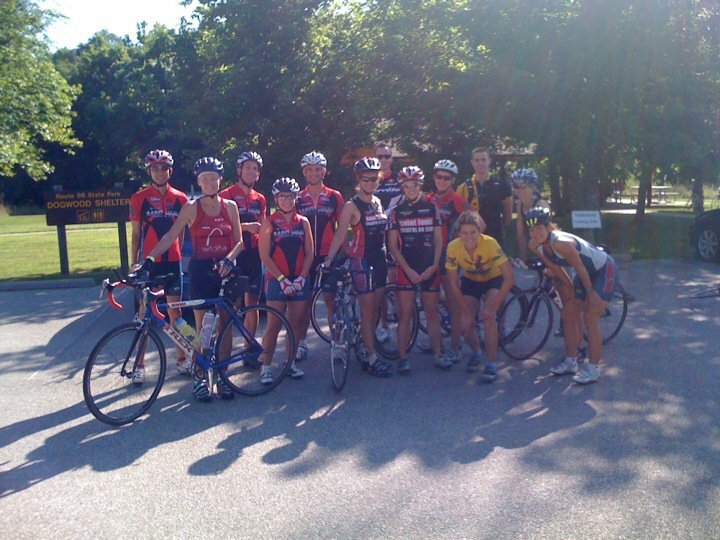 St. Louis Tri Club group starting out a TrailNet ride. But since I was paying hard-earned money to my coach to make me faster, I tried to execute all of the work exactly as prescribed. At first, it was tough. I was bringing my sets to group rides/runs and trying to convince the other people there to do my workout with me. On the runs, no one wanted to go that slow. Same thing on the bike. So I would either abandon my set to ride with the group, or stick with my set only to be dropped by everyone else. Lose-lose scenario. I caught a lot of flack (is that a word?) for this too. My training buddies wanted to know why I wasn't willing to "push myself". They were not convinced that training slower would make me fitter (and would try to debate this with me). Or, they were stuck in the "every training ride/run is a race" mentality and even if they agreed to stay aerobic, by the end of the workout they would push the pace out of my HR zones. Another TrailNet ride, another St. Louis Tri Club group! To say the least, I was frustrated. So I accepted that training solo was the best option for me and ditched the group outings. It wasn't personal to the people I had been training with; I just needed an environment where I could get my own training done. And, it worked. Without the distraction of having to justify my aerobically-based workouts over and over, I just plugged away and got the miles in. And I actually started to prefer training by myself - I could start when and where it was convenient. I could leave gas stations immediately after refueling instead of waiting around for everyone's bathroom breaks. And I forgot about comparing myself to others' pace...my speed is my own, and I own it. 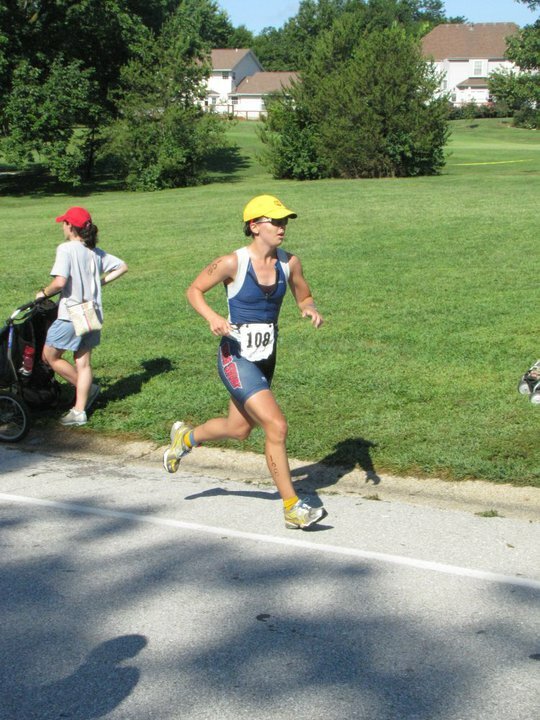 Finishing 2011 LSL Oly Tri. 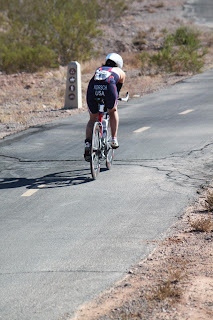 I still look for swims/bikes/runs in my training schedules that are conducive to completing in a group. My rule of thumb is if there are no more than 2 pace changes, the workout is okay for inviting people along. If there are more than 2 pace changes, just do it yourself. Or find a really, really awesome training buddy (comparable in fitness, temperament, and goals...extremely difficult to find!) to bring with you. And be REALLY CLEAR about the workout's goals when inviting others. 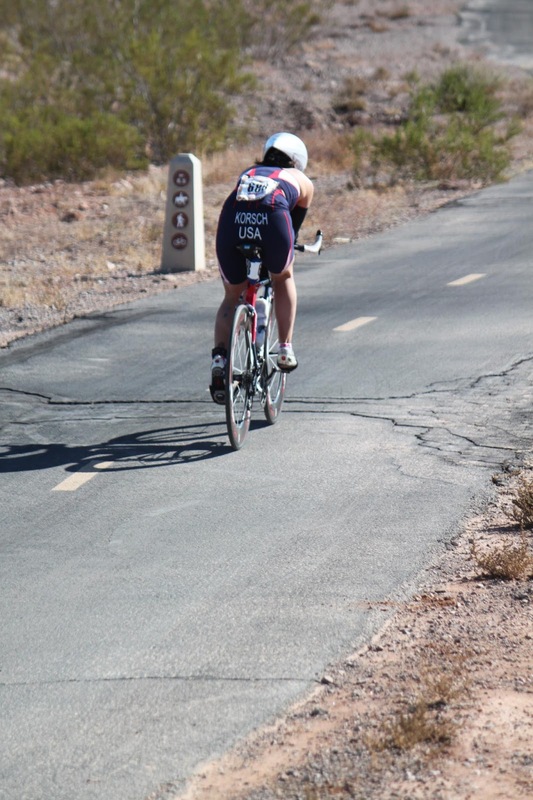 Don't be shy about dictating pace (I have been known to shout "you are going too fast" on several occasions), or about letting groups ride off the front if they are too speedy. Good workouts to do in a group:BIKE (5:00) - warm up with 30 min easy spinning. then get into 4:15 steady aerobic riding. then cool down with 15 min easy spinning. RUN (1:00) - warm up with 10 min easy jogging. then get into 0:45 steady aerobic run. then cool down 5 min easy jogging. Like every rule, there are some exceptions. Group training works out splendidly on the track (if you need speedwork) and in the pool. And while speedwork hasn't been a part of my training for a while, I take full advantage of the pool by swimming with a local Master's group. Not sure how they motivate me to get in the water at 5.15am on a Monday morning, but they do and I thank them for it!! Big River Running's speedwork at its finest. 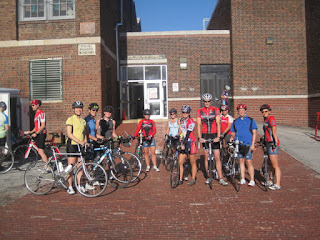 So, all you STL triathletes, here is my long-winded explanation for why I have dropped off the social training scene. Let me reiterate: it's not personal. Well, actually it is. My training is personal to me, and I want to keep my focus there, instead of the group. Solo in training, solo in racing. Not done reading? Here are some somewhat-related articles. Enjoy. Here’s the deal. Don’t do intervals on group rides. Nice summary. I had the same transition a few years ago. Its definitely a hard one! why is STL so far away? I would train with you. and agreed. I miss my running group desperately but no one wanted to have anything on their watch running my long run speed. pooh. Agree with all of this! Sometimes I miss training with other people, but the frustration of having to match their pace wasn't worth it to me. What the heck is going on in that picture of the track? Are all of those people trying to do speed work at the same time? yeah the track nights have 5 simultaneous training groups, all doing the same set but at different paces. it looks crazy but it actually works out nicely, everyone knows which lanes to keep clear. Same here. I used to ONLY train with groups and had a hard time getting out the door without someone to run with. But after getting a coach and starting this IM training, its hard to coordinate schedules and I realize how much I love the time alone. I think after this crazy training block I'll find some sort of balance.